Now just in its second decade, the blogosphere is at once wonderful and horrible. For the global community, fumbling towards some common ground, the opportunity it affords for extraordinary cross-cultural interaction is liberating and unprecedented. ...Yet the democracy of the web is in danger of becoming a cacophonous nightmare. For every carefully crafted, thoughtful expression of opinion, there are a score of half-baked rants: ignorant, bilious, semi-literate and depressing. ...There's another thing that Orwell the great freelance would have been quick to identify: in the blogosphere, no one gets properly paid; its irresponsibility is proportionate to its remoteness from the cash nexus. Worse, the blogosphere, to which all journalists are now professionally committed, not only challenges the old infrastructure of print, but it also sponsors a new prolixity. Recent decades have witnessed an outpouring of research on the contributions of women artists. But as is typical in the humanities, these studies have been qualitative, and consequently do not provide a systematic evaluation of the relative importance of different women artists. A survey of the illustrations of the work of women artists contained in textbooks of art history reveals that art historians judge Cindy Sherman to be the greatest woman artist of the twentieth century, followed in order by Georgia O'Keeffe, Louise Bourgeois, Eva Hesse, and Frida Kahlo. The life cycles of these artists have differed greatly: the conceptual Sherman, Hesse, and Kahlo all arrived at their major contributions much earlier, and more suddenly, than the experimental O'Keeffe and Bourgeois. The contrasts are dramatic, as Sherman produced her greatest work while in her 20s, whereas Bourgeois did not produce her greatest work until she had passed the age of 80. The systematic measurement of this study adds a dimension to our understanding of both the role of women in twentieth-century art and the careers of the major figures. I like Sherman's work. But I doubt it retain its dominance over the next few decades. These days, there are just too many imitators, wherease O'Keeffe and Kahlo were both one of a kind (and with amazing bios too). Let's face it, how many leading women actors want to make a film about Cindy's life story? As for Bourgeois, while at times her work is very innovative, most of it leaves me underwhelmed. The NBER paper is Who Were the Greatest Women Artists of the Twentieth Century? A Quantitative Investigation; unfortunately I can't find a non-gated version. UPDATE: Tyler Cowen also has posted about the paper: he opts for Eva Hesse. Colin Stewart at the Arts of Innovation blog also comments. Russian composer Dmitri Shostakovich was born one hundred years ago today. This year's Proms featured many of his works, and there have been special festivals in London and Austin, among others. Tyler Cowen of Marginal Revolution has an appreciation: As of tomorrow, Shostakovich was born 100 years ago. "He has a higher variance of quality than almost any other major composer". Perhaps so. Or maybe just a wider range of interpretations (both musical and political)? Imagine if every single one of the 214 State of the Unions since 1790 were available online. You could see at a glance not only the speech itself, but also its length, readability grade level (using the Flesch-Kincaid test), and how many times key words appear. Well now you can: via the engrossing State of the Union website by Brad Borevitz. State of the Union (SOTU) provides access to the corpus of all the State of the Union addresses from 1790 to 2006. SOTU allows you to explore how specific words gain and lose prominence over time, and to link to information on the historical context for their use. SOTU focuses on the relationship between individual addresses as compared to the entire collection of addresses, highlighting what is different about the selected document. 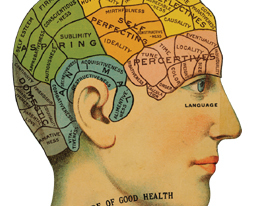 You are invited to try and understand from this information the connection between politics and language–between the state we are in, and the language which names it and calls it into being. Above is a screenshot of the java-enabled interface. Go visit. You won't be sorry you did. Below is a chart from Brad's website, showing the number of times the words 'justice' and 'freedom' have been used in the state of the Union. 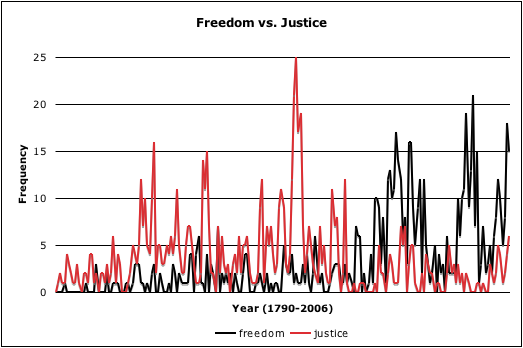 Clearly justice's heyday was in the early part of last century, while freedom is near its previous peak in popularity. I guess we have Dubya to thank for that. Thanks to Andrew Vande Moere from the University of Sydney, and his weblog information aesthetics for the hat tip. This is another site that is well worth visiting. British designers, your country needs you! The predicament of Britain's 'innovation gap' is framed as a paradox - as it has been for decades. How can it be that we have so many star designers and great inventors, but our industry seems incapable of capitalising on them? The truth is that it is neither an accident, nor a paradox that Britain is internationally renowned for both its creatives and its industrial decline. The former is largely a result of the latter. The same few designers and inventors are trotted out time after time: Jonathan Ive, the Newcastle Polytechnic-educated design director at Apple in California; Paul Smith, the self-taught fashion entrepreneur who has built an international brand and retail chain over the past 20 years; and James Dyson of the eponymous Dual Cyclone cleaner. One of the main reasons why Britain's creatives are internationally renowned, and so many of them work for foreign companies, is that British industry is awful at innovation. This is not due to a shortage of ideas, but to a lack of the investment needed to bring ideas to market. Britain fell behind its major competitors on this measure over a century ago and has steadily slid down the R&D investment charts ever since. If you discount spending on pharmaceuticals, aerospace and biotechnology, British investment in innovation is pitiful. This steady industrial decline coincided with the blooming of British design. As opportunities within industry dried up, more designers either worked for foreign firms or for consultancies that had to chase work overseas. Either way, British designers were therefore forced to promote themselves on the international stage. As a London-based consultant designer of stylish consumer electronics, I've had little choice but to work for foreign companies like Apple. Dyson got his first cleaner manufactured in Japan in 1985 after failing to license it to a manufacturers closer to home. But new hotels are springing up everywhere, the package tour brigade are coming en masse, and soon I fear vandalism and sheer weight of traffic will result in large parts of Angkor Wat being fenced off to protect this World Heritage site. See it before that happens. If you visit the temple before dawn you can clamber around virtually alone, while the other tourists linger outside waiting for the requisite sunrise photo opp. The NYT article has some great panoramic photographs of the Bayon and Ta Prohm, as well as a pop-up slide show and voice over. Who was the greatest artist of the 20th century? Examining film and literary prizes' geneses, history and the hoopla that accompanies them, English parses the many ways awards and award ceremonies have become an institutionalized "game" that relies on the condescension and outrage they provoke among critics and contenders alike. He confines his study primarily to writing and film awards, but these provide more than enough fodder for him to produce a remarkably clear anatomy of the way prizes shape their respective worlds; he sagely notes the approximately 4,500 feature films released annually compete for about 9,000 prizes, and while the number of books published every year still outpace number of awards, literary awards have multiplied exponentially since WWII. Some passages are dense with philosophical references and theoretical jargon, but English tempers them with case studies and pop culture examples, including a lively dissection of the perennially maligned Booker Prize, that make his discussion more accessible. Despite the book's narrow scope-it focuses almost solely on judges and the judged, neglecting the effect on consumers-the book brings a refreshing perspective to a conversation usually dominated by reflexive positions. You can download and read the Introduction here (PDF). See also Louis Menand's discussion of the Nobel prize for literature, All that glitters: literature's global economy, in the New Yorker. As a Martian, I see the decline in the value of awards from a different perspective. I think art is difficult to value, there is an information problem, and in such cases it pays to consult experts who can vouch for characteristics such as the artist, etc. that help to determine value. It's not as certain as, say, having gold assayed, but experts serve the same purpose. The proliferation of awards can be viewed as arising from the market failure due to imperfect information on quality. By creating false signals of quality - prizes and awards - there are gains to individuals in the short-run, but in the long-run this behavior across individuals undermines the value of the signal. However pure the motivations of suppliers in the artistic process are, and however demand is generated, once the good gets to market we have a pretty good idea about how the price will be set.